added refinements and comforts of the best European sedans. It is as at home on Fifth Avenue and Rodeo Drive as in the ski country of the Rocky Mountains or the ranches of Texas and Wyoming. 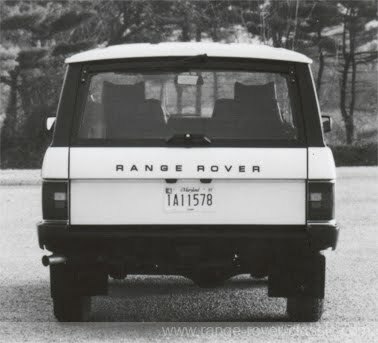 The first Range Rover was launched to international acclaim in 1970. More than 150,000 Range Rovers have been sold on six continents and in 80 countries, from Wimbledon in England to Wagga Wagga in Australia. The Range Rover's fuel-injected 3.5 liter V-8 aluminum power unit delivers 150 bhp, brisk acceleration and a top speed over 100 mph. At the same time, it produces the low end power to handle nearly every off-road condition imaginable. The car's boxed steel frame and reinforced aluminum body panels give it unusual strength and make it virtually rust-free. to compensate for heavy payloads or when towing, keeping the vehicle at the predetermined ride height. 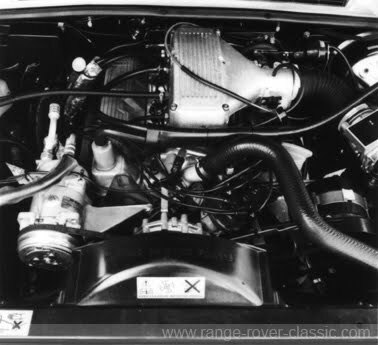 The first Range Rover prototype was completed in 1967 with production following in 1970.
awards. 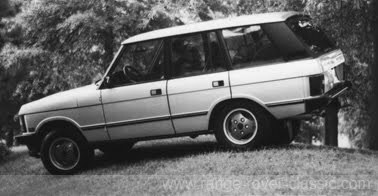 In 1970, for instance, the Range Rover emerged from the London Motor Show with a gold inches long and 70.8 inches high. gained the Royal Automobile Club's Dewar Trophy for outstanding technical achievement. began changing hands for considerably more than dealers' showroom prices. for shopping trips and car pools as for family vacations. RANGE ROVER IN THE U.S. can be removed for extreme off-road duty. fuel injection, four speed automatic transmission interior appointment improvements and the like. a volume of 769,000 units in 1986. They will be sold through a nationwide network of 65 dealers. 1987 sales are forecast at 3,000 units building to 5,000 units annually by 1990.
drive, endorsed by Don Safety Trophy. 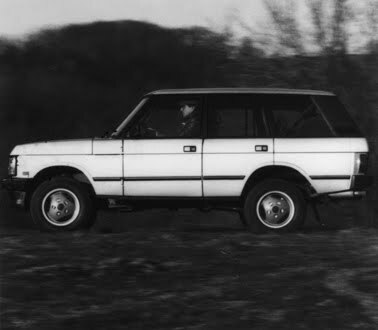 1976: 'Car' magazine's staff test Range Rover, Land Rover, Jeep and Toyota on and off road. inches wide. Conclusion: "We have still not found a vehicle to challenge the Range Rover." 1981: Introduction of four-door model and high-compression version of V8 engine. transmission with LT230R transfer case. 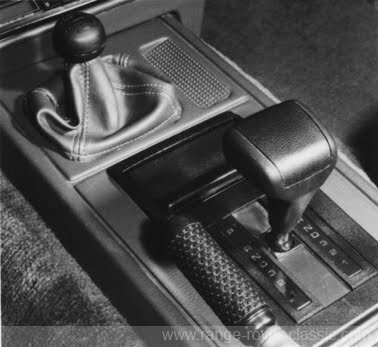 1983: Introduction of five-speed manual gearbox. and competitors from General Motors, Ford, Jeep, Mercedes-Benz and Mitsubishi. Conclusion: "Out of it all emerged the superiority of the Range Rover". June 1984: Further improvements are introduced. Range Rover sales set new records. introduced. Range Rover power is boosted 30 percent to 165 bhp (European). Sales again set new records. 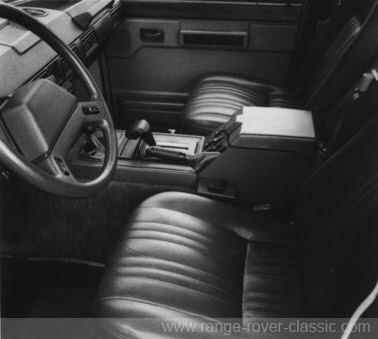 1985: Land Rover UK Ltd. announces plans to market Range Rover in U.S. 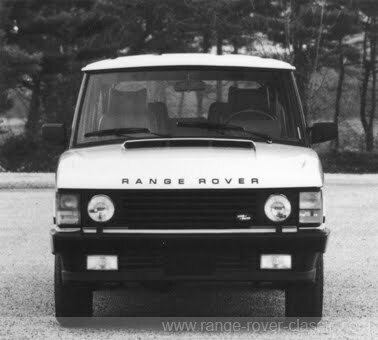 Range Rover of North America Inc. formed. 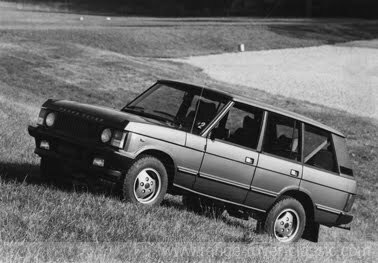 1986: Range Rover voted "Best off-road vehicle" by consumer publication "What Car?". Cited for "excellent off-road ability, elegant styling, interior luxury, long-term reliability." Included in "Car" magazine's '10 Best' listing. Washington, D.C. and Baltimore, MD. produces 150 bhp and 195 ft/lbs of torque. Official dedication October 27 by Her Royal Highness Princess Alexandra. 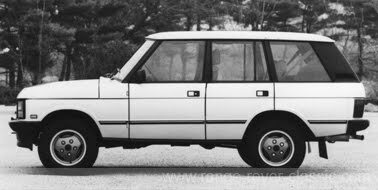 1987: First U.S.-eguipped Range Rovers to go on sale in United States. "CAR" magazine names to '10 BEST' list for second consecutive year. Royalty's favorite sporting vehicle to be sold in the U.S.
the addition of one more name to the list become cause for comment? 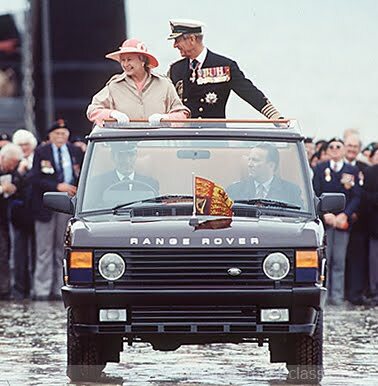 Because the name is Range Rover, a product with a devoted owner body that includes such names as England's Queen Elizabeth II, Henry Ford II, Niki Lauda, Jack Nicholson, the Duke of Westminster, and Scotland Yard. Luxury stable mate of the famed Land Rover, the Range Rover is a prestigious sport/utility vehicle that will take muddy forest track or 40-degree hill in the morning and transport a gowned and black-tied group to the opera in the evening. This unmatched combination of off-road capability and on-road cachet has given the Range Rover a place of honor in the world's most exclusive garages. How has the Range Rover, which will cost just under $31,000 in the U.S., achieved a place in the hearts of motorists who could — and do -- drive $100,000 cars such as Ferraris, Rolls-Royces, Lamborghinis and Aston-Martins? As with any cult product -- and the Range Rover is undeniably that — no simple explanation is forthcoming. But if one were to make an educated guess, the word guality would be a part of it. Quality, in the world of four-wheel drive vehicles, means the ability to get the job done. What job? Any job. In any weather conditions, on any surface, and against all odds. Land Rovers have been doing that since 1948, and the Range Rover has carried on the tradition since 1970.
areas that aren't. After nearly forty years, two of every three Land Rovers built remain in use. "right" and that's all there is to it. take-offs, power pumps, generators and mowers, there were no taxes on them. from the first, a seat at the social table. always identified by name when they are involved in the event." mud, and into the jungle. It had obvious appeal to the sports-minded, but it had something more. would quickly narrow down to one vehicle: the Range Rover." statement. Persons who can afford a $30,000 vehicle are by no means wasteful by nature. money-saving side. Here is a vehicle that can serve multiple purposes, and serve them handsomely. 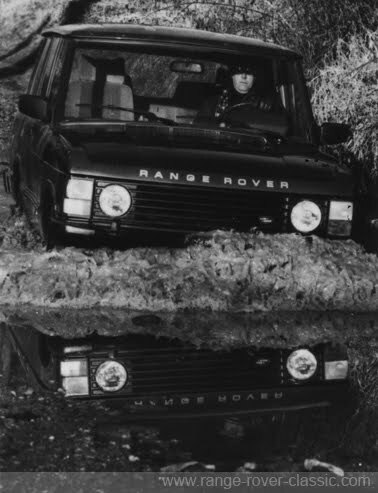 Hughes went on to note that actual "off-roading" would play a small part in the average Range Rover's springs, ride levelling unit and four wheel disc brakes. four-wheel drive. The vehicle is built on a stout ladder-type frame made of welded box steel girders. readiness should road conditions turn suddenly ugly. competitors, need not be stopped to change from two-wheel to four-wheel drive. brakes are installed on all four wheels. washer/wiper, headlamp washers, driving lamps, cruise control and rear door child safety locks. these white lights shine a beam at the ground to help the descending driver or passenger find footing. six years against rust through. 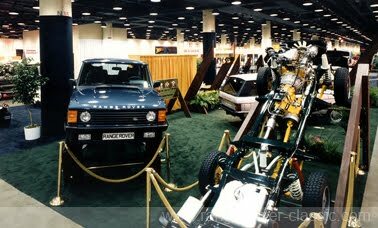 Chicago Auto Show on February 7, 1987.
upholstery will be the only option. countries, from Wimbledon in England to Wagga Wagga in Australia. its first Chicago area dealer. "Bill Knauz is the North Shore's leading auto dealer," said Hughes. "We're very pleased to have him represent us in this important market." and top speed over 100 mph. A four-speed ZF automatic transmission is standard. chosen for their outstanding service and customer satisfaction reputations. Britain's Princess Alexandra, cousin of Queen Elizabeth II. roads end -- then the choice would quickly narrow down to one vehicle: the Range Rover." police, armed forces, farmers and countless other users. and the Ninety (short-wheelbase) versions. European performance sedan levels of refinement. Continuous development since 1982 has enhanced its prestige image and appeal. sales overseas. Interior appointments rival Europe's best touring sedans. gasoline and diesel engines are built using the latest transfer line techniques. of over 100 MPH or crawling muddy slopes of up to 45 degrees. 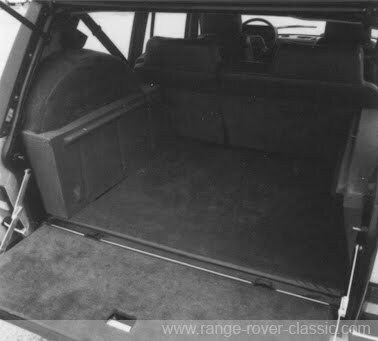 space with the split rear seats folded down. its employees a unique specialist understanding of the product and the needs of customers. turn can be customized for a wide number of applications. with further improvements across the entire range. also available in both the long and short wheelbase vehicles. engine together with an improved four-speed, ZF automatic transmission. enhance the appeal of the comfortable interior. involved in an intensive product development program, which produced record sales in 1984 and 85.
sales in the key markets in continental Europe. Range Rover of North America is a part of the Land Rover group of companies. approximately 35 miles from the port of Baltimore, where Range Rover vehicles will be landed. approximately 35 U.S. dealers in March 1987 expanding to 65 dealers through the U.S. by 1988.
as a nearby off-road demonstration course. Mr. Hughes said, "Our advance planning engineers and researchers have been working toward the U.S.
proximity to our port in Baltimore and the dynamic Maryland business environment." to the front and rear wheels. the widest possible range of conditions; from snow and ice to desert sand and tropical swamps. They have an unrivaled knowledge of off-road driving technigues. Here are a few tips from Roger Crathorne, Land Rover's Demonstrations Manager. * Select "LOW" range on the transfer box and a suitable gear before tackling a difficult section. surfaces. Tackle steep slopes in the "LOW" range and first gear, then rely on engine braking. loss of ground clearance. Reinflate on pavement! reverse. Remove feet from brake and accelerator pedals and use engine as brake while reversing available with the rear seats folded. * Avoid exceptionally deep ruts and other obstacles likely to cause ground-clearance problems. wrong direction can suddenly regain traction with potentially serious consequences. * Cross ditches at an angle with three wheels assisting the fourth's passage. traversed. Load cargo as low as possible. Place passengers on the uphill side of the vehicle. to minimize risk of water drowning the engine. Check brakes after immersion. a winch to pull on. * Avoid prolonged wheelspin if the vehicle comes to a halt. front of the wheels if stuck. photographers but taking it gently often provides fastest overall. the British-built Range Rover luxury four-wheel drive vehicle. Caterpillar will fulfill Range Rover parts requirements out of its 1.125 million square foot Memphis, Tenn.
distribution center. Memphis is considered to be the air freight hub of the United States. The Memphis Parts Department employs about 40 people. "The agreement will assure our dealers of the best possible parts supply system," said Joseph S.
an initial network of 35 dealers. Caterpillar has a similar agreement with Land Rover Parts and Equipment Ltd. in the United Kingdom. companies based in Solihull, England. equipment, and a major manufacturer of diesel and natural gas engines and gas turbines.